The Fokker F.I (company designation V.5) was a German fighter triplane of World War I. It was an improved version of the V.4 prototype triplane. For many decades, the V.5 was misidentified as the V.4. Idflieg designated the first three V.5 aircraft F.I, but all subsequent triplanes were designated Dr.I. Werner Voss was shot down while flying F.I 103/17. Manfred von Richthofen flew F.I 102/17 in September 1917, scoring his 60th victory in the aircraft on the 7th of that month. Von Richthofen then went back to flying his Albatros D.V. Kurt Wolff was shot down in F.I 102/17 on 15 September 1917. 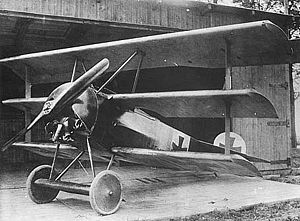 F.I 101/17 was tested to destruction in August 1918, failing at a load factor of 7.75.